Actually, the end has been nigh surprisingly often over the last few decades, and everyone has an opinion about how and when it’s going to happen. I’m hedging my bets on global warming. For three Canadian Jehovah’s Witnesses, the end seemed imminent last November. So imminent that there wasn’t even time to get dressed. In a plea document obtained by the Canadian Press, two women and a man admitted to kidnapping three people in the western province of Alberta last year, which brought a degree of clarity to the bizarre incident last November. One of the women also pleaded guilty to dangerous driving. Canada police arrest five naked people after ‘bizarre’ car crash. 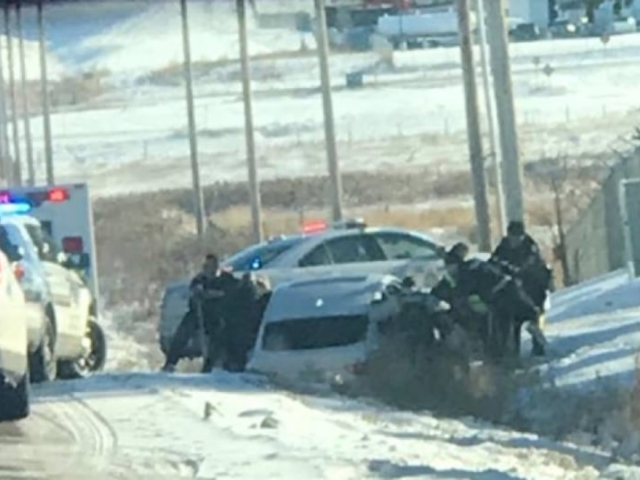 They arrived to find a white BMW that had collided with a truck; inside were five people – four of them naked – despite the centimetres of snow on the ground and temperatures that hovered around 10C (50F) below zero. According to the plea document, this whole situation actually started a few days earlier. One of the women took her teenage daughters to visit her 27-year old nephew and his 30-year old wife, who lived in Alberta. After three days at the house, where they barely ate for some reason, the whole family got it into their heads that they had lived through the Great Tribulation, a period of suffering which some evangelical Christians believe heralds the second coming. Armageddon – a game the whole family can play. Believing they were in imminent danger, the group fled the house – but in their haste, none of the family – except the mother – managed to get dressed, the document says. “Four who were naked were changing but they had to leave right away because it was unsafe, so they left without clothes,” the plea document said. The group piled into a BMW SUV – which the mother drove through the garage door to make their escape – but then decided they needed to rescue the neighbours. And you thought your neighbours were bad. I’ll give them this – they committed to rescuing their neighbours no matter what. They forced a man into the trunk of their vehicle and made his adult daughter and her baby climb into the back seat. “They did so because they believed that they were in danger, either from bad or wicked people outside or from demons,” says the guilty plea. The BMW then raced down the highway, blasting through a red light as its occupants chanted “Jehovah” over and over. The neighbours managed to escape by flagging down a passing truck when the SUV slowed down. The police arrived on the scene after the SUV collided with the same truck which then ended up in a snow-filled ditch. These people are really bad at “the rapture”. When police responded to the accident, they faced a group who “displayed extreme strength” and refused to leave the vehicle. According to the court document, one of the teens believe the officers were “were monsters who would kill them”. Police eventually resorted to using a combination of pepper spay and tasers to subdue and arrest the passengers. At the time, police suspected drugs or alcohol might have been a factor in the incident. The father of the two teens – who wasn’t present during the incident – told investigators that he fears the group might have consumed a hallucinogenic tea. Drugs would explain a lot, but no narcotics were mentioned in the plea document. Looks like religion really is the opiate of the masses. Or in this case – the acid of the few.